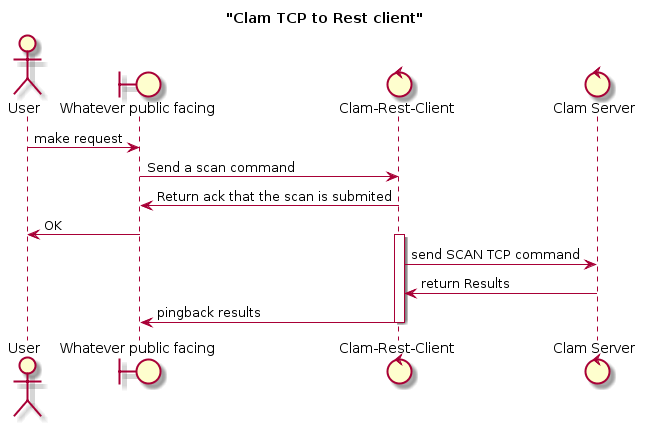 Some time ago we at Peopleperhour published a Clamd container and now for the sake of learning some GO code and as a POC, I am writing about how to create a clamd client to expose a subset of the clams server TCP commands. The client code can be found in this git repo of clam-rest-api/overview and the distributable container can be found in dockerhub. The distributable container is only ==2MB== and when decompressed it will take up to ==5M== of disk space. It is stateless and easily scale, just add more instances of this client. I followed a simple guide on how to install and configure GO into my system, I am not going to get into more details cause it is not in this scope. I thought first to try and understand what is that I want to accomplish with this client. > The goal is to publish some subset of the Clamd TCP commands so that you do not have to deal with the TCP commands :D.
Also for the Clamd server, I am using the one I have created for Peopleperhour, you can use whatever other servers you like. To note here the actual implementation of the production Peopleperhour TCP client is very different and not in GO. You only have to specify the CLAM_SERVER to point to the Clamd TCP server and the CLAM_PORT with default to 3310. This is only to check that the web part is up. This should not be used as a health check. This is the health check that a load balancer should check. It validates that the server can indeed execute a remote TCP ping to the Clamd server. Scan a remote file from a URI. This operation has the logic of submitting a file to be scanned and when complete (in a separate go routine) then the application will send back to a notify url the results. When the file is scanned you will get the results in your pingback url that defined in the submit of the file.